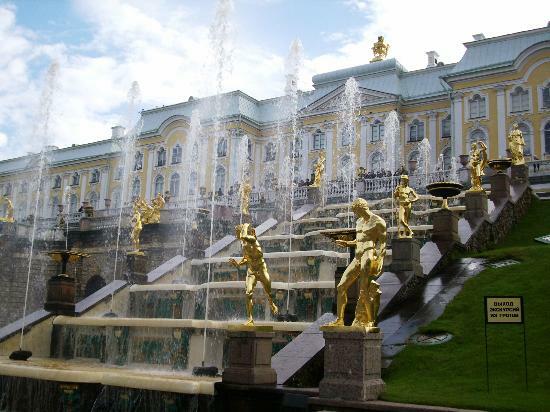 Peterhoff, on the outskirts of St. Petersburg, was first built by Peter the Great in the European style of the time (16th century). 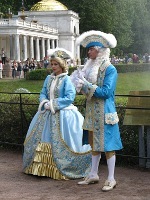 Peter’s goal during his reign was to bring Russia into the European community. As part of achieving this goal, he built buildings in the European style, created gardens in the European style, had men shave their beards to conform to European style, and changed the style of clothing to conform to European style. The Peterhoff built by Peter the Great contained rooms paneled in wood, as was the style of the time. It was later expanded and redecorated by Peter’s daughter Elizabeth, who created rooms in the lavish baroque style with gold leaf to be seen everywhere. Later, Katherine II, Katherine the Great, expanded the palace even more and redecorated many of Elizabeth’s rooms in the classical style she preferred. Today only one room, the study of Peter the Great, remains decorated in the original wood paneled style. Peterhoff was almost completely destroyed by the Germans during WWII with only the external walls remaining. Since then restoration work has been ongoing to return the palace to its former splendor. To guide the restorers were black and white photos, a small number of original items salvaged from the ruins and the memories of people, including descriptive letters etc. The outdoor gardens of Peterhoff are extensive and beautifully laid out and maintained. Dispersed among the gardens are many beautiful fountains that work without the benefit of pumps, using only gravity to provide the needed water pressure. Peter the Great and his engineers first designed this system, still in use today, in the 1700’s. Also in the gardens are several hidden “triggers” on pathways that will provide the unwary with a refreshing “shower” when activated. These were the brain child of Peter who was fond of practical jokes. They are still a source of amusement for children today. Below, because of the perspective, the colums of water shot into the sky by the fountains appear to be as high as the roof of Peterhoff. Also on the grounds of Peterhoff, along the shore of the Baltic Sea, is Peter’s private summer home. It is a small home situated to allow Peter to watch the ship traffic on the Baltic. Peter loved the sea and ships and at one point even apprenticed himself to European ship builders to learn how to construct ships. He later used this knowledge as the basis for constructing the first Russian fleet. In this small home Peter would entertain friends from all countries and walks of life without servants to interrupt them. The table in the dining room was designed to drop down to the floor below where servants would set it and the needed food provided for Peter and his guests. It would then be returned to the dining room on the upper floor. Standing 6ft 6in in height, Peter was a formidable man who could hold his liquor well. One of his favorite amusements was to pour a huge vessel full of vodka and give it to a guest. To be polite, the guest then had to drink all of the vodka in the container. The vessel is on display at the small private home and must hold at least a full modern bottle of vodka and probably more. My assumption is that most guests did a faceplant long before they managed to consume all of the vodka. The next morning’s headache must have been a doozy. Wow! I visited Peterhoff in 1965 (I was 17). Brings back memories.